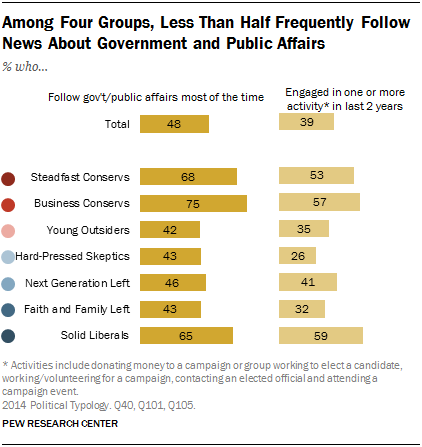 On several measures, three groups stand out for their participation in politics: Solid Liberals, Business Conservatives and Steadfast Conservatives. In addition to being the most likely to say they always or nearly always vote, these groups also donate money, contact elected officials and discuss politics with others at the highest rates. Fewer in the Faith and Family Left (74%) always or nearly always vote, and vote intentions are comparable among the Next Generation Left (76%) and Young Outsiders (75%). 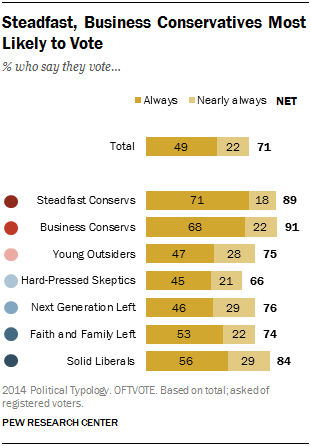 Hard-Pressed Skeptics are the least likely to say they always or nearly always vote (66%). A similar pattern emerges when it comes to paying attention to government and public affairs and engaging in political activities. Fully three-quarters of Business Conservatives (75%) follow what’s going on in government and public affairs “most of the time,” as do about two-thirds of Steadfast Conservatives (68%) and Solid Liberals (65%). Among the four groups in the middle of the typology, less than half follow government and public affairs to the same degree. The three more partisan groups are also more likely to engage in a variety of activities related to politics. About four-in-ten (39%) say they have donated money to a campaign or group working to elect a candidate, worked or volunteered for a campaign, contacted an elected official or attended a campaign event in the past two years. More than half of Solid Liberals (59%), Business Conservatives (57%) and Steadfast Conservatives (53%) have engaged in one or more of those political activities in the past two years. The share drops to 41% among the Next Generation Left, 35% of Young Outsiders, 32% of the Faith and Family Left, and 26% of Hard-Pressed Skeptics. In general, that trend holds for each of the individual activities. Solid Liberals, Business Conservatives and Steadfast Conservatives are significantly more likely than people in the other groups to have donated money in the last two years. They are also much more likely to have contacted an elected official. Solid Liberals stand out as more likely than those in any other group to have worked or volunteered time for a candidate or campaign. Government and politics ranks alongside health and medicine as one of the general topics people are most interested in. Yet there are wide disparities between the typology groups. About half of Solid Liberals (52%), Business Conservatives (59%) and Steadfast Conservatives (54%) list politics and government as one of their top-three interests. 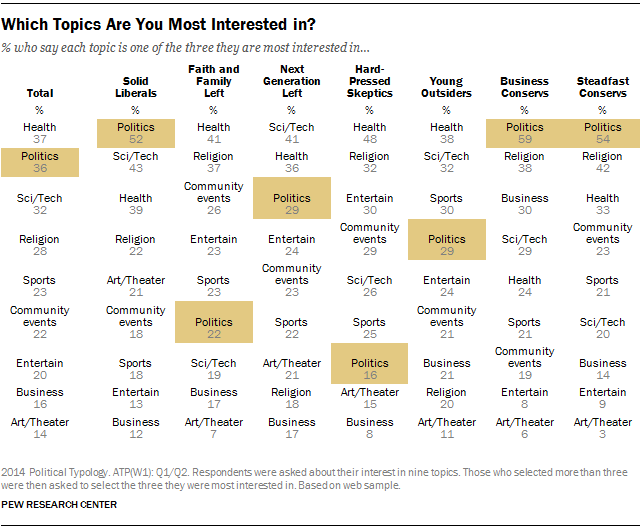 Among the other groups, far fewer list politics as one of their top interests. In addition to being more interested in government and politics, Steadfast Conservatives, Business Conservatives and Solid Liberals are the most likely to discuss government and politics with others; about six-in-ten report doing so at least a few times a week, compared with four-in-ten or fewer of the other . Another key measure of political engagement is how knowledgeable people are about the current political landscape, and here again the more ideological groups score far higher. Nationwide, just 40% of Americans can correctly identify the partisan balance in both the House of Representatives and the Senate (that Republicans have the majority in the former, and Democrats in the latter). The remaining six-in-ten know only one (33%) or neither (28%) of those facts. Business Conservatives are the most likely to correctly identify the majority party in both houses of Congress (69%), followed by Solid Liberals (60%) and Steadfast Conservatives (54%). Fewer than half in any of the other groups can correctly identify the majority party in both houses. 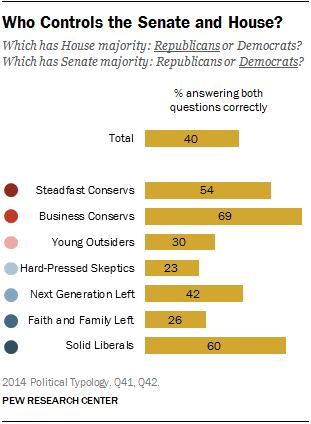 About four-in-ten (42%) of the Next Generation Left, just three-in-ten (30%) Young Outsiders, and only about a quarter of the Faith and Family Left (26%) and Hard-Pressed Skeptics (23%) are able to correctly identify . These differences are exhibited in how people communicate about politics as well. The two most conservative groups and the Solid Liberals are more likely than those in other groups to say they enjoy talking about politics with friends and family. In addition, those three groups are the most likely to have friends who share their views on politics. More than half of Steadfast Conservatives (58%) say most of their close friends share their views, as do 49% of Business Conservatives and 45% of Solid Liberals. By contrast, far fewer in the middle four groups say this about their close friends, instead saying they either have many friends with different points of view, or simply that they don’t know their friends’ political views. 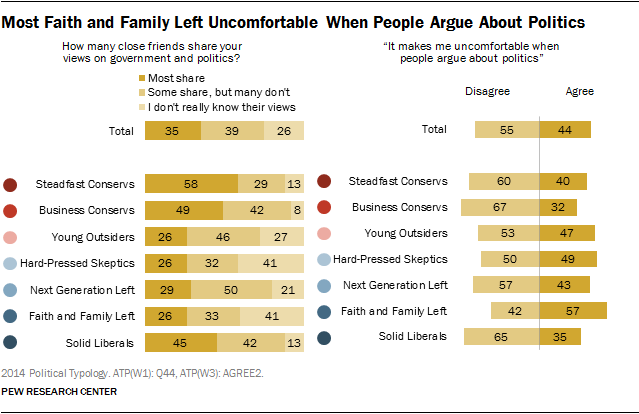 In that same vein, those three groups are more likely to disagree than agree with the statement: “It makes me uncomfortable when people argue about politics.” By contrast, more among the Faith and Family Left agree than disagree that they are uncomfortable when people argue about politics (57%-42%).